The new Disney version of Rudyard Kipling’s The Jungle Book is what this franchise-tentpole-universe-theme-park factory does best. The film is a triumph of technology and safe “family” storytelling. It’s dazzling — almost no one will dislike it. Its director, Jon Favreau, knows his audience, and he has enough skill and honest enthusiasm to win over all but the most determined skeptics. The gimmick is that the movie uses a real actor, Neel Sethi (pronounced Sett-ee), as Mowgli, the boy raised by wolves. But Sethi is surrounded by brilliantly computer-animated wolves, panthers, tigers, and bears. At times, they look more real than the actor, who seems computer-enhanced — made smoother, his skin burnished with a golden Disney-ish caramel, or made to fly at impossible speeds when he’s carried off by monkeys. The slight artificiality of everything makes The Jungle Book seem all the more seamless. Untethered by reality, its settings are huge, its cliffs and waterfalls like something out of James Cameron’s Avatar. And that makes sense, since Mowgli is our avatar — the wide-eyed human who holds his own against beasts of the jungle and finally earns his place in the natural world. Do you remember the plot from the Kipling stories or the ’40s feature starring Sabu or the hit 1967 Disney cartoon? It’s more or less the same. As a baby, Mowgli was delivered to the wolves by a black panther named Bagheera, who’s voiced with stentorian British plumminess by Oscar winner Sir Ben Kingsley. Bagheera remains a sort of headmaster, commanding Mowgli to use only his wolf skills, not his human opposable-thumb ingenuity. The doting mother wolf is voiced by Oscar winner Lupita Nyong’o. Idris Elba is the nasty tiger, Shere Khan. Giancarlo Esposito is the alpha wolf. The late Garry Shandling is a porcupine. Favreau is a pygmy hog, and his kids are in there as some of the cubs who consider Mowgli their brother. It’s a cozy, A-list kinda jungle. And a veritable Disney World, too. These animals have a near-utopian existence — even happier than the one in this year’s other animated hit, Zootopia. During the dry season, various species declare a truce and gather at a stream to share what little water is available. When the level rises above a certain rock, they’ll supposedly go back to business, but it’s hard to picture these cuddly creatures eating anything but plants (assuming the plants don’t sing). Well, there is that tiger Shere Khan, who has a peculiar antipathy towards the “man cub.” To protect Mowgli, the wolves decide to send him back to the human village from which he came. But getting there won’t be a walk in the park. The journey is thrillingly kinetic. Watch Mowgli grab the horns of some charging buffaloes (or bison — I’m not good on bovine species) and go hurtling over a cliff. Watch a very friendly 30-foot python named Kaa (voiced by Scarlett Johansson) curl around him and open her mouth wide, so wide. Eventually, Mowgli ends up in the cave of a supremely lazy bear named Baloo. The bear — voiced by Bill Murray — promptly puts Mowgli to work climbing cliffs to steal honey to fatten him up for hibernation. But do jungle bears hibernate? Murray is an irresistible sleazy hipster, an ursine Peter Venkman. The only problem is that he has one of the best songs in the Disney canon, the Sherman brothers’s “The Bare Necessities,” and he doesn’t really … he isn’t quite … He can’t sing. So he wails in time — he tries to do it bluesy — and kills the great melody. I had to go home and listen to Phil Harris’s original from the ’67 cartoon to quench my thirst for the actual notes. 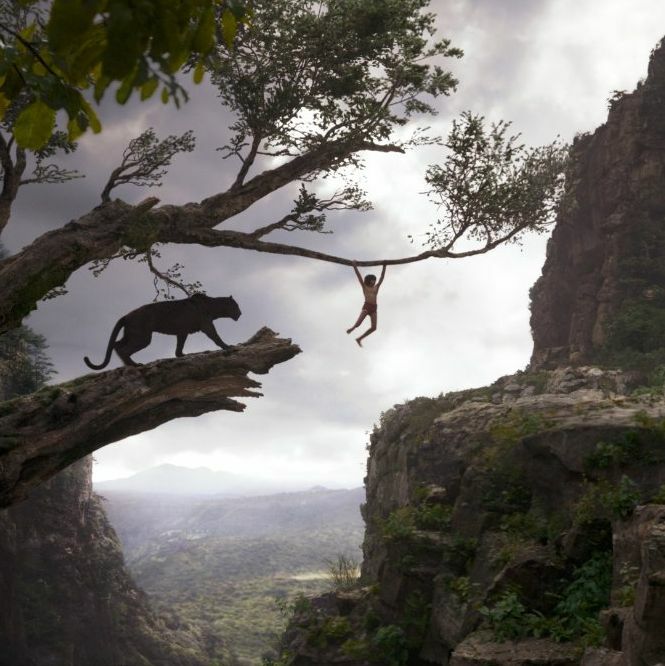 Favreau has told the press that this Jungle Book is closer to Kipling’s original insofar as the animals are savage, and Shere Khan does get into it with Bagheera and even Baloo. Little kids might be shaken up. Some grown-ups, too. But this isn’t Kipling. It’s not the fashion these days to speak up on behalf of the Bombay-born Englishman who was thoroughly comfortable with British colonialism. But I was weaned on his Jungle Book stories. The Just So stories were just so. I wanted a mongoose after Rikki Tikki Tavi. It’s Kipling’s grasp of politics that makes his work exciting on so many levels. I mean interpersonal politics — or, in this case, inter-species. His animals do cooperate and, in some cases, risk their lives for humans. But they’re plainly predators and their main concern is the survival of their species. In the stories, the wolf pack wants to kill Mowgli after the man-cub’s protector ages out of his alpha-male status. Kaa the python is so much more interesting than in the movie! He (he’s a he) cooperates with Bagheera and Baloo to save Mowgli from the monkeys only after they promise to share their future kills. And Mowgli from the start knows he’ll have to destroy the tiger Shere Khan to ensure his own survival. He knows the real law of the jungle. The point is that Kipling sweetens this world without sanitizing it, and no matter how much his vision reeks of patriarchal colonialist condescension, it’s a damn sight more acute than the Disney Company’s. Don’t misunderstand: This version of The Jungle Book is wonderful. But what does it say when even a myopic colonialist has a deeper vision of how the world works?